The sleeve tattoos give you a variety of designs to select from. They give a good area to express the symbolism of the tattoo with designs like floral, tribal, Polynesian, dragon, etc. The half sleeve tattoo design includes the half part of the arm only that is, from the shoulder to the elbows only. 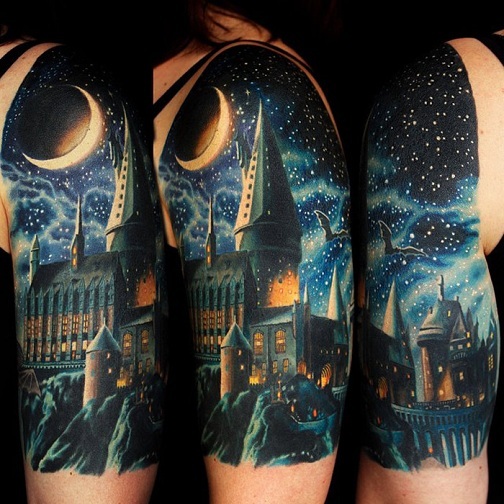 Here are some of the best half sleeve tattoos that might strike your heart with a single glance. 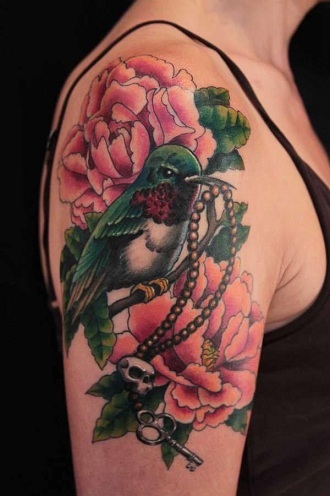 A colourful bird for tattoo half sleeve gives a drastic look, widely inked by women. The design includes a bird, rose, and a skull lock with a key attached to it. The tattoo symbolized freedom, death, love, loyalty, hope, etc. Inspired by the series of Harry Potter! The arm tattoo for men half sleeves are the perfect area to portrait the designs that are stolen from the series like the design of the Hogwarts School. The design can also carry your favourite character from the movie. 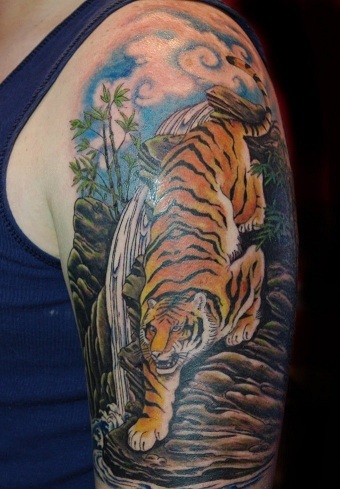 Dangerous animals have always been the prime choice for the mens half sleeve tattoos. Among them, tigers are mostly selected along with the beauty of the nature with a colourful touch to represent strength, invincibility and power. Love drawing a cute baby devil! Why not get it inked on the body! Yes, this delicate and sweet tattoo has won the heart of several people. The devil is inked in red with a surfing pose on his weapon. 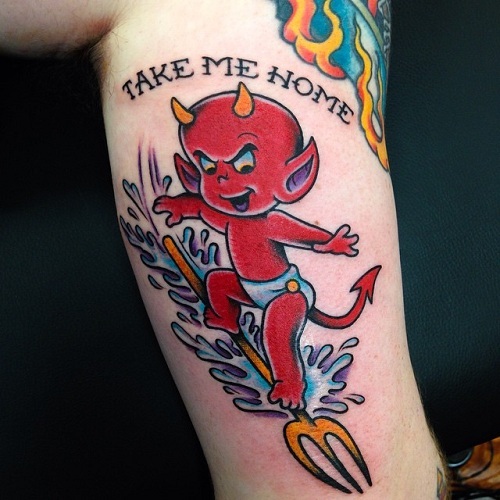 It also carries a message; take me home, which comes to mind on its first glance. 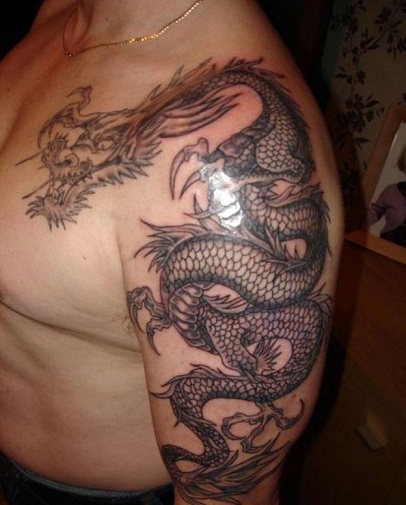 The category of cool half sleeve tattoo includes the pattern of a dragon too. The tattoo carries a dangerous looking dragon tattoo with flaming outlook. The design of the dragon indicates magical powers, imagination, nobility, perseverance, etc. 3D tattoos have given the skull tattoos a new dangerous definition. 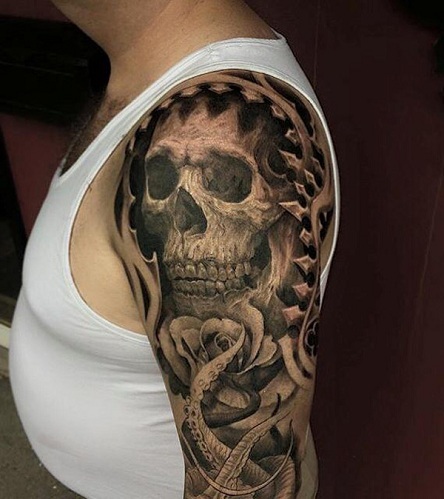 The half sleeve tattoo with a skull emerging from the arm gives a precarious look with spares border in black and grey shading. The design also includes a rose and wild stem too. A tattoo half sleeve cover which carries both bold quotes and night scenario is carried by the art lovers. 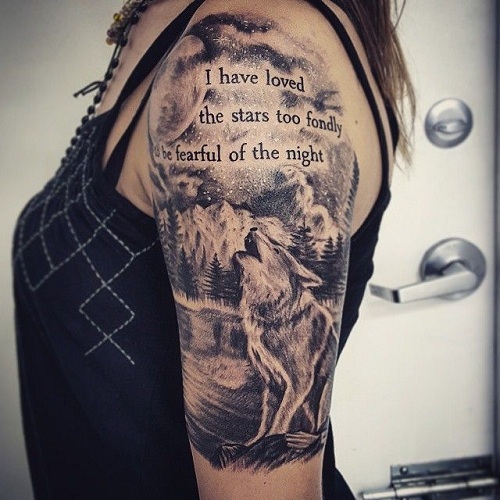 The tattoo carries a wolf hauling facing the sky at night with quotes on the sky that work as the feeling or belief of the wearer. 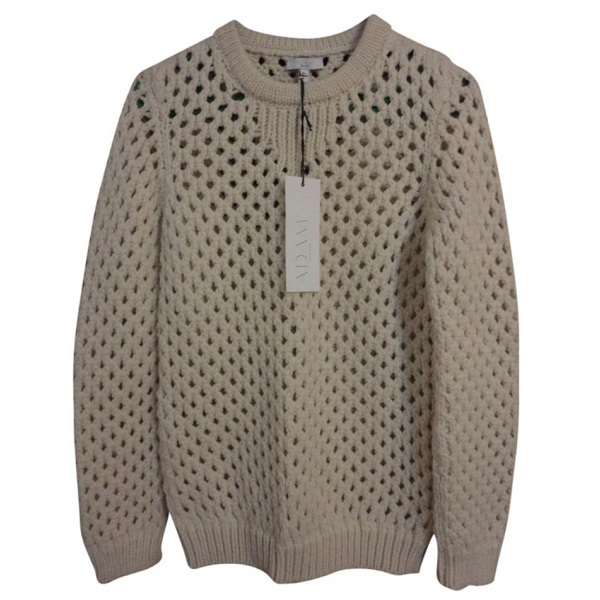 This one is famous among college girls. Want to give a religious touch to your outlook! Ganpati tattoo half sleeve ideas have a variety of patterns for you to get inked. 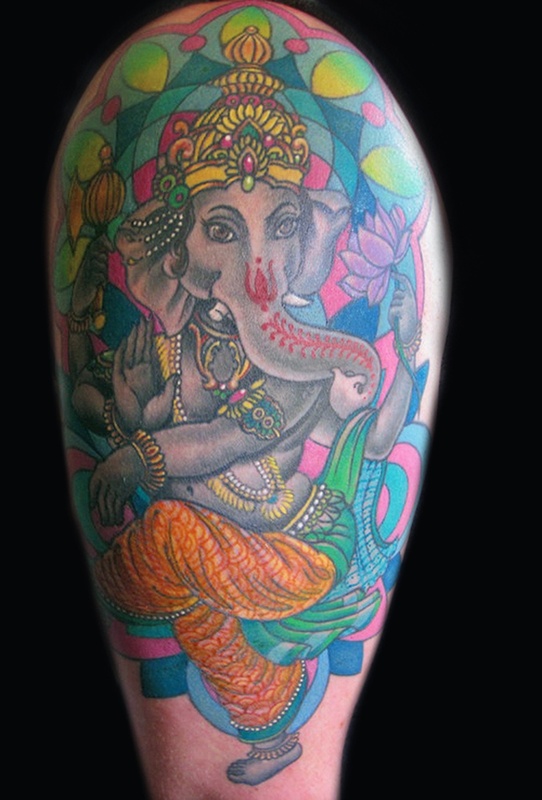 The tattoo is quite famous among the youth where Lord Ganpati comes with various poses like sitting, dancing, face tattoo, etc. When Ganpati festival comes that time youngsters like to design a god Ganpati in various postures. 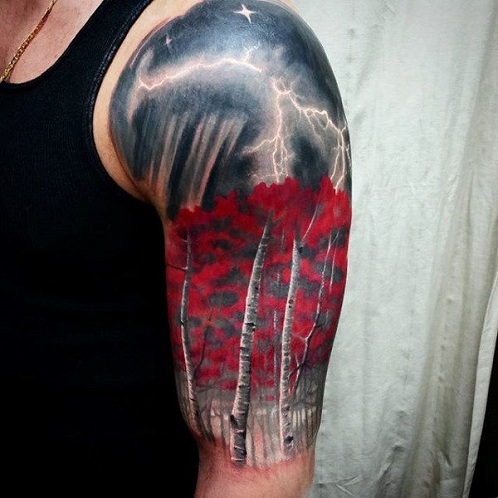 Half arm tattoo cover sleeve design which covers both the birch tree forests and the lightning from the sky give an imaginative look to the wearer. The black sky with white lightning effects and red birch around represent power, nurturing, energy, durability, etc. This is one cool design among the youngsters. 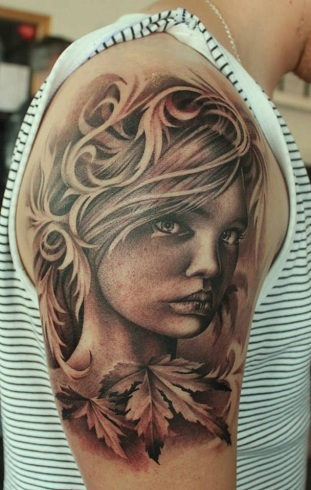 Portrait tattoos are the best way to dedicate your love or feelings towards someone among the half sleeve tattoos. The arms give it a great space to feature the face of the person very beautifully. When given in black and grey ink, it brings the keenness live. You can design your personal mate photo too; get some sketching style in this pattern of design. 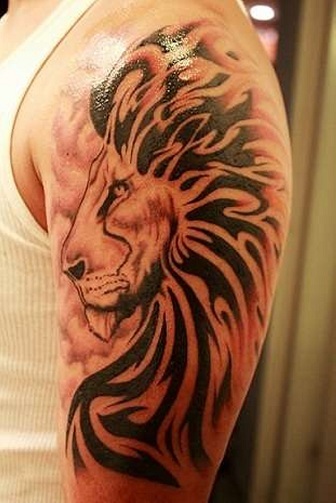 Half sleeve tribal tattoos when designed with the image of a lion gives a robust look to the arms. The head hair of the lion is made with dark ink in curves using the tribal designs. The tattoo shows feelings like strength, power, leadership, sportsmanship, etc. If you have an attitude, then goes with this design to grab attention. 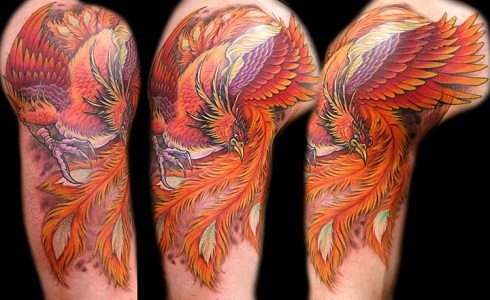 Phoenix tattoo cover half sleeve gives a colourful and delightful look to the viewer. The phoenix represents fall and rebirth of man, immortality, regeneration, faithfulness, etc. 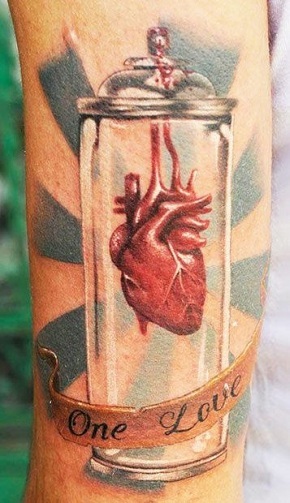 A tattoo design that reveals the true love to someone is the heart on the bottle tattoo for half sleeve. The tattoo carries a heart which is locked in the bottle with a tag one love on it, which shows the true love for someone. Flower half sleeve tattoo made by crafting a baby with a dandelion flower gives an appealing look. The tattoo is widely inked by the women or girls. The tattoo also carries the name and the date related to the person to whom the tattoo is dedicated. 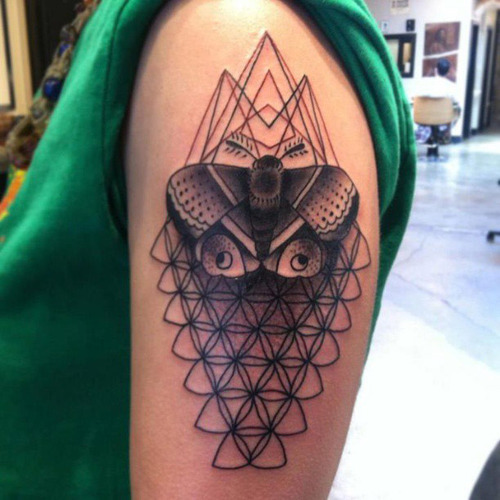 Sacred geometric tattoos are the best designs for small half sleeves design. Inked in dark black, the design is made with geometry shapes which result in the design of a butterfly, and two eyes in the center. The half sleeve tattoo is the best place for getting the best and desired design inked. Along with all these, other designs that can be traced are Celtic, fish, dove, wolf, space, Jesus, etc. If you use regular vests or you are a fitness lover then try this kind of tattoos to impress your friends or partners. Get some simple or multicolored half sleeve tattoos to accept good comments; you will get more options in this style of unique pattern. As per your profession like a musician, you can try some proper design from expert tattoo designers. Hair Colors for your Skin Tone – How to Choose?